20-30% of your promotions are unprofitable Here is how to fix them! Retailers spend between 3-10% of their revenue on promotions. Our research indicates 20-30% of all these promotions are unprofitable. In this article we outline how retailers can increase the %-share of profitable promotions and improve overall margins with 2-5%. Promotions are a critical component of the marketing mix and one of the biggest items on a retailers P&L statement. Formulate's research suggest that grocery retailers spend ~2-5% of the revenue on promotions, where the same figure is ~5-10% for retailers within fashion and durables. Today retailers run thousands of promotions in a typical year, many of which are unprofitable. Anywhere between 20% and 30% of all promotions (up to 50% in some really bad cases) are actually unprofitable in that they don't generate a sales lift sufficient to offset the promotion cost despite supplier funding. A significant improvement opportunity. In this post we outline some practices how retailers can improve the promotion performance and increase the overall profit margin with 2-5%. To improve promotion performance retailers first need to find a way to continuously calculate the True Lift from every single promotion down at the SKU level. And share this True Lift data with the entire merchandising organization and preferably also with suppliers. So they can use it throughout the merchandising process from follow-up, to vendor negotiations and forecasting. For most retailers this can be achieved by using the existing point of sales data. 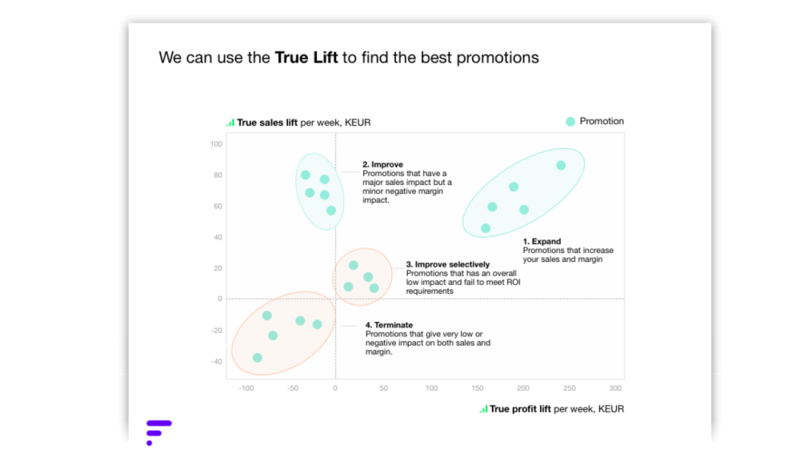 When calculating the The True Lift metric it is important to both capture the incremental sales lift that a promotion generates above the baseline, as well as all the other factors that impact the promotion performance; cannibalization effects, up-sell effects, and stockpiling effects. Our experience is that most retailers don't have this. And therefore they struggle to choose the promotions that help achieve the company objectives. To summarize, most retailers can improve their overall margins by 3-5% if the work more efficiently with their promotions. This requires that the true lift is continuously calculated for all promotions. That this information is shared across the organization and used throughout the campaign process. Stay tuned for our next post to further move the needle by working proactively with predictive promotion analytics!